And welcome to Miraear’s Threads. Miraear is a mildly unfortunate storage character on Lord of the Rings Online; she holds on to all of my cosmetically interesting items that aren’t character-bound for the rest of my characters, who actually get to play the game (or at least do some important crafting) while she is stuck hanging around the vault in Celondim. She is an Elvish minstrel on the server Elendilmir. 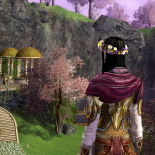 This entry was posted on 2014.03.17 by vyh in Uncategorized and tagged cosmetics, elendilmir, lord of the rings online, lotro, outfits, wardrobe.